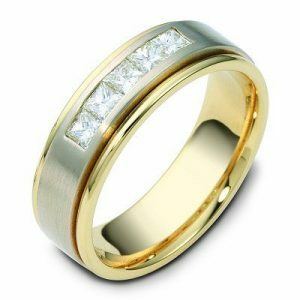 This solid two tone gold diamond wedding ring is 7mm wide . 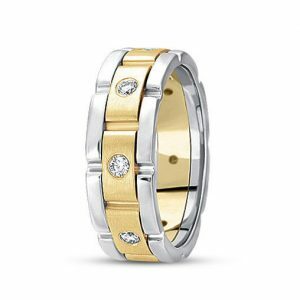 This wedding band is decorated with 8 round brilliant cut diamonds; totaling approx. 0.24 carats .The diamonds are graded as G-H in color & VSI in clarity.The rings has a satin and shiny finish. This solid white gold diamond wedding ring is 7mm wide . 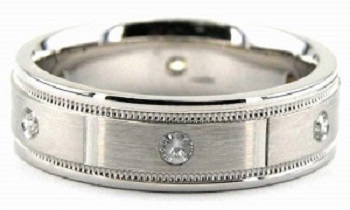 This wedding band is decorated with 8 round brilliant cut diamonds; totaling approx. 0.24 carats .The diamonds are graded as G-H in color & VSI in clarity.The rings has a satin and shiny finish. This solid white gold diamond wedding ring is 8mm wide . This wedding band is decorated with 8 round brilliant cut diamonds; totaling approx. 0.40 carats .The diamonds are graded as G-H in color & VSI in clarity.The rings has a satin and shiny finish. 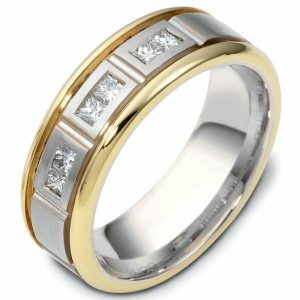 This solid two tone gold diamond wedding ring is 7mm wide . This wedding band is decorated with 1 princess brilliant cut diamonds; totaling approx. 0.10 carats .The diamonds are graded as G-H in color & VSI in clarity.Center of the ring has a satin finish and edges are shiny finish. 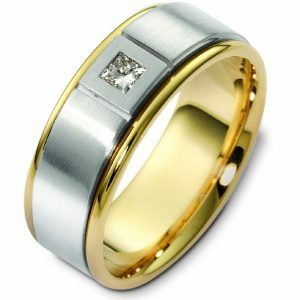 This solid two tone gold diamond wedding ring is 7mm wide . This wedding band is decorated with 6 princess brilliant cut diamonds; totaling approx. 0.30 carats .The diamonds are graded as G-H in color & VSI in clarity.Center of the ring has a satin finish and edges are shiny finish. 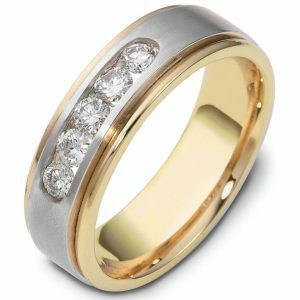 This solid two tone gold diamond wedding ring is 7mm wide . 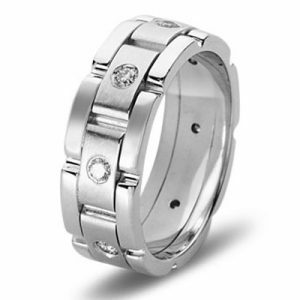 This wedding band is decorated with 5 round brilliant cut diamonds; totaling approx. 0.35 carats .The diamonds are graded as G-H in color & VSI in clarity.Center of the ring has a satin finish and edges are shiny finish. 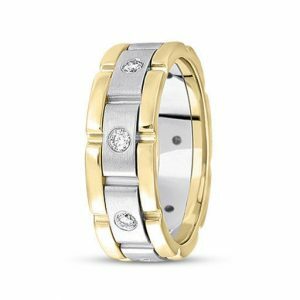 This solid two tone gold diamond wedding ring is 7mm wide . This wedding band is decorated with 5 princess brilliant cut diamonds; totaling approx. 0.50 carats .The diamonds are graded as G-H in color & VSI in clarity.Center of the ring has a satin finish and edges are shiny finish. 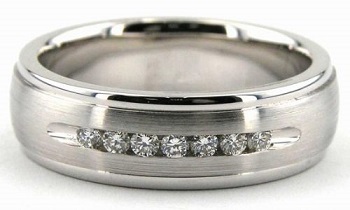 This solid white gold diamond wedding ring is 6mm wide . This wedding band is decorated with 8 round brilliant cut diamonds; totaling approx. 0.24 carats .The diamonds are graded as G-H in color & VSI in clarity.Center of the ring has a satin finish and edges are shiny finish. 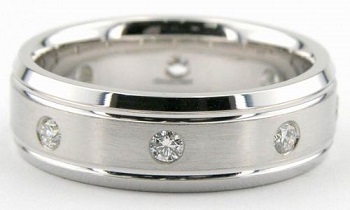 This solid white gold diamond wedding ring is 6mm wide . This wedding band is decorated with 7 round brilliant cut diamonds; totaling approx. 0.14 carats .The diamonds are graded as G-H in color & VSI in clarity.Center of the ring has a satin finish and edges are shiny finish. 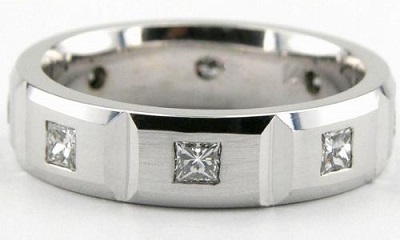 This solid white gold diamond wedding ring is 6mm wide . This wedding band is decorated with 8 princess brilliant cut diamonds; totaling approx. 0.64 carats .The diamonds are graded as G-H in color & VSI in clarity.Center of the ring has a satin finish edges are shiny finish. This solid white gold diamond wedding ring is 6mm wide . This wedding band is decorated with 8 round brilliant cut diamonds; totaling approx. 0.24 carats .The diamonds are graded as G-H in color & VSI in clarity.Center of the ring has a satin finish milgrain on each side and edges are shiny finish. © 2017 Prestigeweddingbands.com | All rights reserved.